Fresh Fruits is the second collection of Tokyo street fashion portraits from Japan’s premier street fanzine. 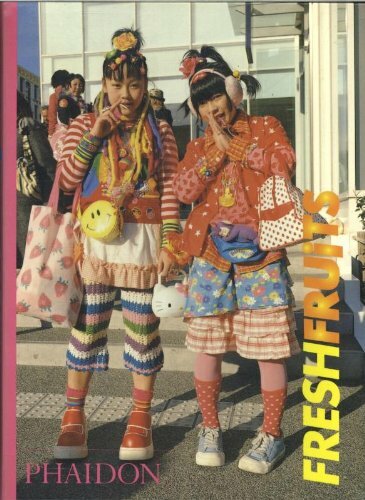 ‘Fruits’ was established in 1994, by photographer Shoichi Aoki, initially as a project to document the growing explosion in street fashion within the suburbs of Tokyo. The magazine has grown to cult status and is now avidly followed by thousands of Japanese teenagers who also use the magazine as an opportunity to check out the latest styles and trends. The average age of the kids featured in the magazine is between 12 and 18, and the clothes that they wear are a mixture of high fashion – Vivienne Westwood is a keen favourite – and home-made ensembles which when combined create a novel, if not hysterical, effect. This second extensive collection of portraits represents a unique documentation of the continually changing face of street fashion.